Very Good. 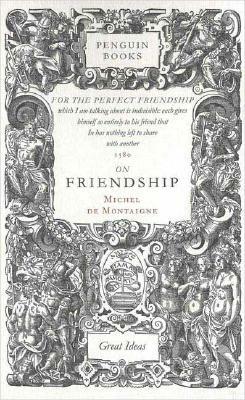 On Friendship (Great Ideas) by Montaigne, Michel de. Trade paperback (US). Glued binding. 128 p. Great Ideas. New. 2004. New Ed. Mass Market Paperback. Expresses the author's views on relationships. This title contemplates the idea that man is no different from any animal, argues that all cultures should be respected, and helps us to understand the nature of humanity. Series: Penguin Great Ideas. Num Pages: 128 pages. BIC Classification: HPC. Category: (G) General (US: Trade). Dimension: 182 x 112 x 8. Weight in Grams: 82......We ship daily from our Bookshop. Very Good. No Jacket. 12mo. Uncreased white card covers, in the Penguin Great Ideas series.